Lebkuchen is a traditional German baked Christmas treat, somewhat resembling gingerbread. 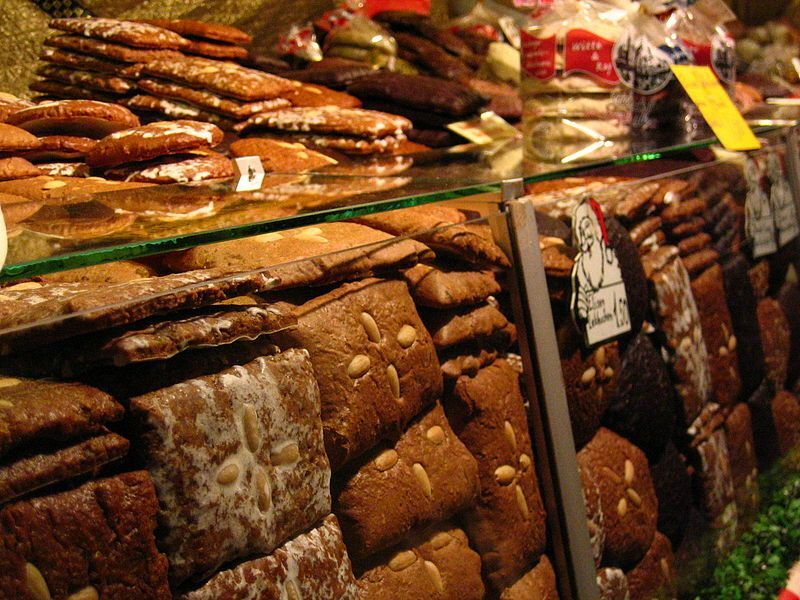 Lebkuchen can be rectangular or round. Our recipe calls for Oblaten (wafers) on the bottom that will give them a rounded shape. Enjoy! Whisk flour, baking powder, salt and spices. In a food processor, pulse almonds and hazelnuts until finely chopped. Add candied fruit peels and pulse until finely chopped. Add almond paste to nut and fruit mixture and combine. Then add jam. Add eggs and brown sugar. Add flour mixture. Once mixture is dough-like, transfer to an airtight container and refrigerate overnight. Preheat oven to 325 degrees. Place Oblaten on a baking sheet and drop approximately 1/4 cup of dough on each. Spread dough to the edges of the Oblaten keeping a slightly higher center. Place almonds close together on top of each cookie. Bake until golden brown, about 14 minutes. Let cool completely on sheets on wire racks. Whisk confectioner’s sugar and milk, and brush over cooled cookies. Let stand until set.